You are here: Home / Cat Breeds / Are Savannah Cats Good Pets? Are Savannah Cats Good Pets? If you’re ready to own exotic cat, you may consider a Savannah cat, but are Savannah cats good pets? The Savannah is a wild cat hybrid, and as such can be quite feisty. They are great pets for active, adult owners that are happy to spend lots of time entertaining them and providing them with good outlets for those natural behaviors. This wild cat mix was created by cross-breeding a African servals with a domestic shorthair cats. The descendants of these matings have also been bred with Eqyptian Maus and Ocicats to introduce or fix desirable qualities. Savannah cats were developed to make a cat that looks like a serval but with the behaviors of a domestic feline. Each generation is given a filial number to tell you how far back their closest serval ancestor was. An F1 Savannah has a serval parent, an F2 Savannah has a Serval grandparent, and so forth. But are Savannah cats good pets to own considering their wild ancestry? Here we help you decide if a Savannah cat is the right pet for you. What makes a good pet cat? A good pet cat is one that suits your personality and lifestyle, and fits comfortably into your household and daily schedule. When choosing a pet cat, it is essential that their disposition and care needs appeal to you, as well as their looks. 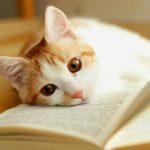 Research the breed of cat you want thoroughly using our breed guides, to decide if it is an active cat you desire or one that is more sedate, especially if you have young children. Other factors to consider include grooming and overall health. Long-haired cats require regular grooming whereas a short-haired cat is easier to maintain and makes less of an impact on your carpet when they shed. 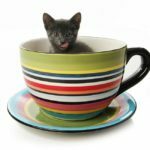 Some breeds are prone to certain hereditary conditions and diseases, so consider this when choosing your favored choice of cat. As well as being distressing to watch, treating cats with avoidable health problems can also be very expensive. So, what about Savannahs, are Savannah cats good pets? What does a Savannah cat look like? The Savannah cat has an exotic, cheetah-like appearance with a spotted pattern coat, that comes in a variety of colors. He can be up to twice the size of your usual domestic cat, but not bulky – quite the opposite! He is renowned for his long body and long legs, short thick tail, large tall ears situated right at the top of his head along with distinctive hooded eyes revealing dark tear duct lines. How big do Savannah cats get? The size of a Savannah cat depends on the generation. An F1 generation is the largest and can weigh anything from 17 to 30 pounds, standing up to 18 inches at the shoulder. Later generations tend to be smaller as their wild inheritance becomes watered down. The exotic Savannah has a wild influence so are Savannah cats good pets to own? This cat loves being around people and often described as being a dog in a cat’s body, greeting his owner at the front door then following them from room to room. They also adore playing and swimming in water! In the wild, servals often hunt by snatching fish out of the water, and it’s clear these instincts haven’t disappeared in the Savannah cat. Active and playful, the Savannah cat requires lots of interaction with their owners, often playing jokes on them. A good sense of humor and plenty of patience is essential for sharing a home with these mischievous cats! Because Savannah cats have the wild genes of the African serval, many people consider them dangerous. Early generations with a high proportion of serval DNA have a far less predictable temperament than fully domestic cats. Even after several generations, they are far more accomplished hunters than the average domestic moggy. If they get to roam outdoors this can be a disaster for local wildlife. In response, some countries have restrictions on owning Savannah cats below a specified filial number, or require you to take out a licence to own one. And in certain States in the USA they are illegal. Check your local legislation before finding Savannah breeders! Most pet Savannah cats are F8 or beyond, meaning they only have a very small amount of wild DNA left. The vast majority of these cats are no more dangerous to people than any other domestic cat. 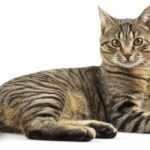 Do Savannah cats require grooming? Savannah cats have a short coat so only require occasional brushing. Gently brushing kittens from a young age and rewarding their cooperation is a good way to teach them appropriate domestic behaviors. Continuing to sit with your Savannah every week for once over with a paddle brush will also give you a chance to check their overall condition and spot problems like weight loss and skin conditions quickly. No cat is entirely hypoallergenic. Savannah cats still produce the FelD1 protein in their skin and saliva which triggers an allergic reaction in people with cat allergies. However, Savannahs are low-shedding, and anecdotally produce a less-than-average amount of dander. If you have allergies, you might be able to tolerate a Savannah cat, but only meeting the one you might buy can tell you for certain. Savannah cats are generally healthy. However, they do have a smaller than average liver due to their serval ancestry. This makes them more prone to side effects of certain medications. 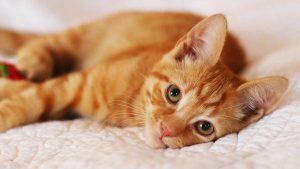 Hypertrophic Cardiomyopathy (or HCM, caused by thickening of the heart walls) is a common concern in purebred cats and often found in some breeds that are crosses of domestic and wild cats. However, the Savannah is no more prone to HCM than any other hybrid cat. Possibly the biggest health concern with these wild hybrid pets is finding a vet with the right experience to treat them. Find out how close your nearest suitable vet is, before you take the plunge! How long do Savannah cats live? The Savannah cat lives between 12 to 20 years depending on their generation. This is longer than the typical domestic housecat. What do Savannah cats eat? F1 and F2 generation Savannah cats are more likely to have the eating habits of a wild serval. 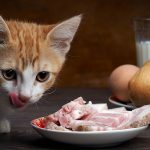 This can make them decidedly picky about eating pre-prepared cat foods, and less able to digest them comfortably. Many Savannah cat breeders recommend feeding your Savannah a raw meat diet, or a diet supplemented with some raw food, but is not essential. Your Savannah cat can safely eat commercial dry or wet cat food provided it uses top quality ingredients, contains high levels of protein, and is grain-free. To help you find the right diet, visit our review of the best Savannah cat foods. How much is a Savannah cat? Savannah kittens are extremely expensive with the price depending on the generation. 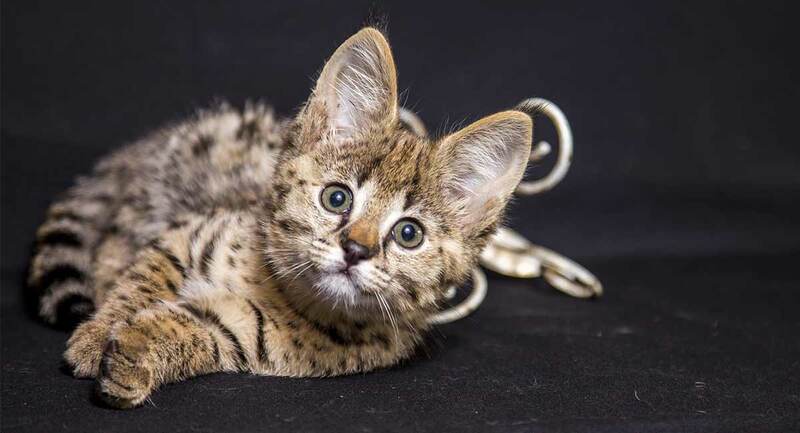 A female first generation serval-domestic cat cross can cost up to $20,000. These cats are best left to breeders with experience of looking after wild animals! Male Savannah cats are usually sterile until the F4 or F5 generation (an important evolutionary adaptation to prevent hybrid animals being created all over the place). So their value peaks a few generations after the value of females, since the most valuable cats are those with excellent breeding potential. Moving down the family tree, an F8 kitten can cost around $700 depending on how closely they resemble the sought-after serval blueprint. Do Savannah cats get along with other cats? In the wild servals are highly solitary. But in this respect the friendly Savannah cat seems much more like their domestic ancestors! Does their good nature stretch to other cats? This will depend very much on the individual. Servals are fiercely territorial, and your Savannah cat might inherit their distaste for sharing their space. They also have a high prey drive, which could potentially be disastrous around smaller animals. When Savannah cats do along with other cats it is usually with those of a similar activity level and nature, such as another Savannah, a Siamese, or Abyssinian. Are Savannah cats easy to care for? Savannah cats are highly active and extremely intelligent so needs lots of physical and mental stimulation. A Savannah cat requires plenty of toys to play with and will even play fetch and learn tricks. 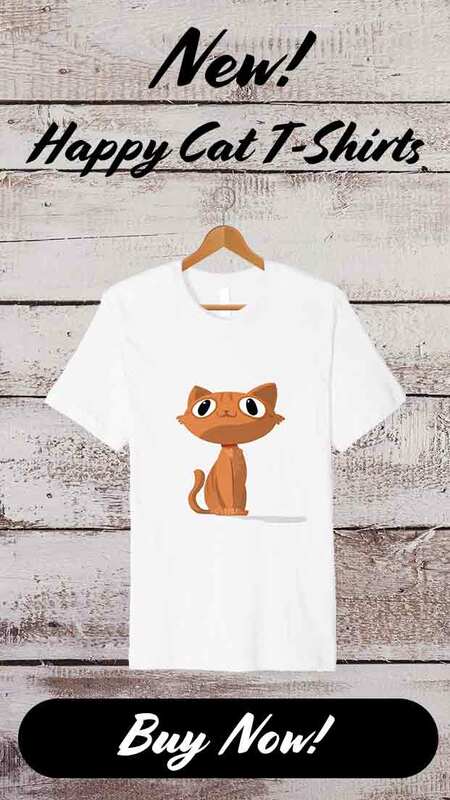 Be sure to provide cat perches and trees around the house for him to jump on. Most owners believe their Savannah cats don’t have the homing instincts to get back if they are allowed out, and therefore don’t let them roam outdoors. These unusual cats also have a high value if they are recognized by a cat thief. As a result, many owners only let their Savannah out in an enclosure with a secure roof, or walked on a leash. Although loyal and loving, there are certain things regarding the Savannah cat that potential owners should be aware of before buying one. They are notorious for opening doors and cupboards, chewing wires and destroying plants, so you should childproof your home! The Savannah cat wants your individual attention, so if you have small children it might be wise to wait until they need less of your time. The highly intelligent Savannah can soon figure out how to open the lid of a small pet’s enclosure, so think carefully about keeping hamsters, birds and fish safe. So, are Savannah cats good pets or are they best avoided? 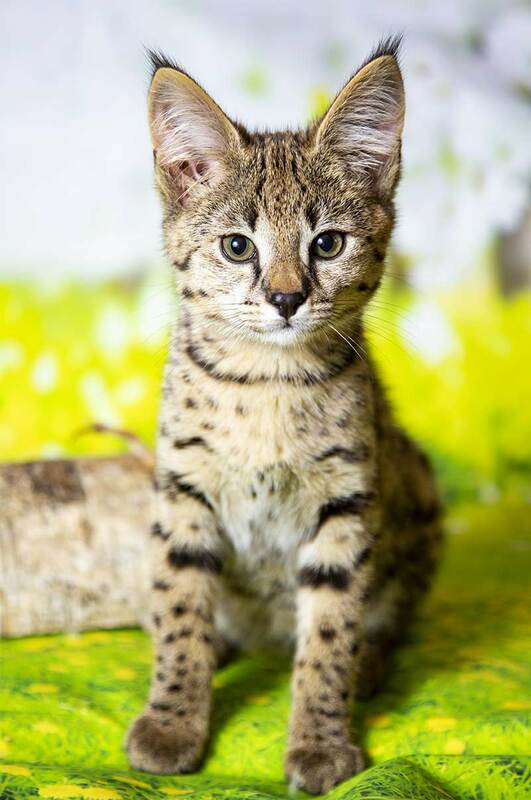 This unusual breed with its exotic appearance makes the Savannah a most desirable cat to own. They are friendly and entertaining – life with a Savannah will be anything but dull! However, being partly wild makes the Savannah an extremely active cat with a need to run and jump. They require the right kind of owner to handle and entertain them. Otherwise, they can be incredibly destructive. The Savannah is perfect for an experienced cat owner who has lots of time to give to this loveable and loyal feline. First and foremost make sure Savannah cats are not prohibited where you live, and you have the resources nearby to give them the right diet and veterinary care when they need it. Do you already own a Savannah cat? Please share your thoughts in the comments box below! Murphy, W., Genetic Analysis of Feline Interspecies Hybrids, Tufts University, 2015. Rush et al, Population and survival characteristics of cats with hypertrophic cardiomyopathy, JAVMA, 2002. This is a good informed article. I have F2 and F3 Savannah cats and I would never call them dangerous and have read entirely too many articles that say they are. They love to play fetch and are much more loyal than the usual domestic cat. that being said, the days of having glass decorations and glass picture frames sitting around on coffee tables or shelves are gone. They are gymnasts! But I think the trade off is worth it! I think as more breeders are having success, the prices are coming down a bit. The average price for an F2 is $5000 now and an F3 is around $3000. Thanks! Well I thought I had done my research before hand for at least 10 years or more, but I guess it is true that you really don’t know all there is to know until you’ve experienced it hands on. Most of the things I knew and expected but there has been quite a few surprises along the way. I have two F-1 male savannah cats and I swear they are plotting to take me down in the future. I use to say it jokingly but now, its seems true at times. They are so smart and aware of everything that’s going on around them at all times. They are very high maintenance and it seems like most of my time is devoted on catering to their needs. It’s been an experience that not too many people are able to experience and I do feel fortunate in some ways but they are work 24/7 and my entire house is rearranged around them. It’s very much a habitat and doesn’t even look like a person lives in the place! And it just dawned on me that I know I won’t ever be able to take a vacation! Not even a short weekend getaway. Nobody will watch them mainly because its such a big responsibility and liability which I can understand and don’t blame them. But I have them now for the long haul and I enjoy them as equally as I don’t for all those times they get under my skin. And so true there is never a dull moment around here on any given day!! I do have 2 other domestic cats which I have to keep separated from the savannahs. I just don’t trust them and sometimes I don’t think they even are aware of their own strength and I just won’t take that chance unless I am right there. It seems like I’ve got young children all over again with the baby lock on all the cabinets, keep the bathroom doors closed because even with the lid of the toilet seat down they will open it up and jump in the toilet and make a mess! And all the trash cans have to be covered and the trash can secured so they don’t knock it over and pull out all the trash! I can go on and on but at the end of the day I have grown to love them as I knew I would and I would do anything for them to make their lives stimulated, comfortaable and them to be happy cats!! I have an F4 Savannah male cat who I have had now for 13 years coming up May 11th. That is my Savannah’s birthday his name is Sira. I also have two pixie bobs that are the same age. My Savannah and my pixie bobs have been together since they were born they came from the same breeder. The breeder I purchase them from also breeds both Pixies and Savannahs. My Savannaha was a lot in the beginning. However, I trained him not to gorge his food. I am like his mom. He was aggressive in the beginning. I got him at 4 months. I taught him not to bite, this was by biting him back on his cheek. I only had to do that once. He gets along great with my 2 pixie bobs because they were raised together. He is like a puppy and is always by my side. He loves and plays with my grandaughter who is 3 turning 4 in a few days. He has never hissed or scratched anyone and is as dossile as a baby. Now this summer I have decided to get a puppy. Its a Golden Retriever and will be 2 months old. Im hoping he will be ok with it. Im going to introduce slowly , by keeping them seperate for a while and then introducing them through the iron screen door and the front porch. Then introducing through the crate. Im hoping all will go well. The patience is key when doing this. All and all Savannahas are great cats. You can have a life .You just have to make sure the person who watches your Cat, does not let it outside. And gives lots of attention to it. If a Savannaha gets loose outside. It will not come back .it will be very disorientated. l have an F4 male, Zooie. l got him at 7 months. He did not take to change well. l kept him separated from my other cats, and my dogs for three months. Not because l thought he would hurt them. He was simply frightened. He slowly warmed up to everyone. He and my borzoi, Mitzi, are now best buds. He gets along with everybody, loves babytalk, and sitting on the sofa with his mom (me). He is not fond of strangers, and hides. He loves lazers, wand toys, climbing (or jumping) as high as he can. He is very good using the litter box ( which can be a problem with early generations). He is a well loved king of the Universe! I agree with the general consensus—they’re bright, wonderful, mischief makers. My F4 fellow Rex was given to me when his mama—my best friend—was paralysed in a car accident and had to move into assisted living. I was the person she’d ask to cat sit on work trips, so he came to stay with me. He is so, so smart. I find him at the door when I get home from work, and after months of assuming he’d learned to read the clock, I’ve just realised this month that it’s because he recognises the sound of my car! My sister took it to pick up a recliner that her little coupe couldn’t fit, and did he ever scramble to the door when she was pulling up out front. I came down the steps behind him and the confused look on his little face was priceless! I’m quite sure he thinks I’m a magician. He IS mischief incarnate, though. I can’t walk away from a drink or plate of food, EVER (I’ve actually taken to only drinking from a stainless steel Contigo water bottle with a latching, locking sippy straw-type lid at home, because when it’s closed it can’t spill and the double walled steel is borderline indestructible—I shut it in a car door and it’s fine) and I always have a companion around at bath time, up to AT LEAST his armpits in my bathwater, but I figure that (and all the money I spent on new cables for my laptop, phone, tablet, tv…..) is a small price to pay for all the laughs and walks and cuddles and hours of fetch and high fives and other great things I get in return. He’s a beautiful boy and wonderful companion, and I’d take him again and again and again, even knowing the mischief he gets up to.